**Professionally structured, exciting, tried and tested itineraries to the heart of Europe's best destinations, iconic and well-know attractions. **Fixed day price of €78 per person per day (plus mandatory tip for the tour manager and driver of €7 per person per day), so you can choose the length of your tour (1-35 days). One of the most competitive, transparent and flexible prices in the market. **Multiple and convenient joining points along the tour routes, you can tailor the booking and perfectly match your trip requirements. **Guaranteed weekly departures: operating year-round for Red, Green and Blue line; April to October for Purple and Yellow lines. **Offering a wide range of optional excursions, designed to enhance the customers's tour experience. 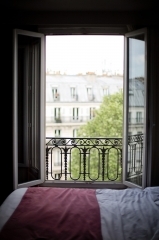 **Accommodation is carefully picked to ensure a quality selection of minimum three-star hotels (in the city or city nearby), all of which provide continental breakfast. **Fully escorted, with the service of an experienced and knowledgeable tour manager and the expertise of a local tour guide in some cities. **Modern and spacious air-conditioned coach, experienced coach driver. The morning begins with a leisurely drive north-west from Frankfurt to Bonn, the capital of the former West Germany until reunification. The national government is now run from Berlin, but Bonn retains a rich history that is well worth exploring. Discover the city’s secrets on an orientation stroll through its streets, walking past highlights such as the Rococo-fronted town hall and Ludwig Van Beethoven Haus, a museum celebrating the life of the much-loved composer. Then it's on to Cologne, where you'll head inside the city's glorious Gothic Cathedral, a UNESCO World Heritage Site. The rest of the afternoon is yours to explore Cologne further, to do a spot of local shopping or to simply relax with a suitably refreshing German brew. After lunch the day is rounded off with a drive into the Netherlands. A day of delights begins with a leisurely trip through the Dutch countryside, where you’ll get to sample at close quarters some of the things that the Netherlands is traditionally famous for: clogs, cheese and windmills. Call in at the hugely popular model town of ZaanseSchans. 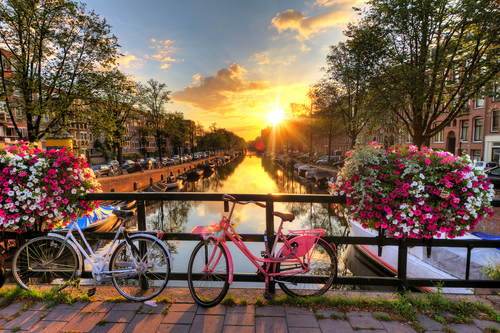 Next, you'll head from the quiet countryside to the cosmopolitan city as your journey takes you back to Amsterdam. After visiting a well-known diamond factory, where you’ll see the unique cutting techniques that have been practised here since the 16th century, you can take an optional hour-long pre-dinner canal cruise, which is a great way to discover more about this unique European city. After disembarking you'll walk to one of the city's grandest areas, Dam Square, where the Royal Palace is located and the Queen's birthday celebrations take place. You'll have photo opportunities here, free time for shopping or further sightseeing, and then round the day off with dinner. After leaving Amsterdam in the morning you’ll head south across the border into Brussels, the Belgian capital and political centre of the European Union. On the way, the tour stops to see the distinctive Atomium monument, a cell-shaped structure of stainless steel spheres and tubes built for the 1958 World's Fair. In the centre of Brussels itself an orientation tour will call in at the exquisite Grand Place, as well as seeing the famous impish MannekenPis Statue.After some free time, during which you can try some mouth-watering Belgian delights. Then from Brussels it’s south again across the French border and on to the bright lights of Paris. 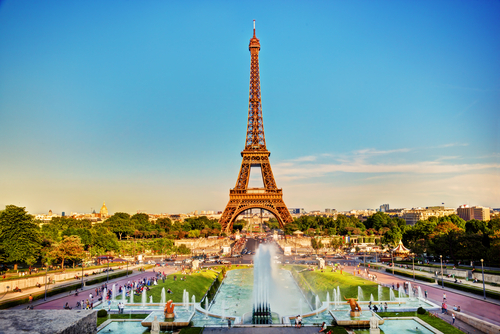 Paris is your oyster over the next two days as you enjoy guided tours around one of the world's most celebrated cities. Your Parisian adventures get off to a spectacular start with a drive along the famous ChampsÉlysées to the Place de la Concorde, which played such a key part in the French Revolution. You'll also get to see the iconic Arc de Triomphe here too, the imposing monument that sits near the western end of the avenue and commemorates the fallen of the revolution and Napoleonic wars. You'll take in another significant historical building next as you head to L’Hôtel National des Invalides, where Napoleon's tomb is located, followed by a stop at the most legendary of all Paris's icons: the Eiffel Tower. You can either take time to explore the neighbourhood and have some lunch or scale the Eiffel Tower.Choice is yours. Finally, you'll travel on the coach out through the Parisian suburbs to the splendid Palace of Versailles, the vast regal château that was the residence of the royal family until the start of the revolution in 1789. Today the palace is another popular Parisian attraction. In the evening, you can enjoy one of our optional Paris evening shows. The second day of your Parisian experience begins with a visit to the Louvre, one of the world's greatest art museums. Here you'll set your eyes upon some of history’s most famous masterpieces, including the Venus de Milo, Winged Victory of Samothrace (also called Nike of Samothrace), and Leonardo da Vinci's Mona Lisa. Opt for a guided gallery tour, which will enhance your experience and allow you to browse through hundreds of works in just a few hours. You can then take a leisurely cruise along the river Seine, a great sightseeing option that offers splendidc views of iconic Parisian landmarks, including Notre-Dame Cathedral and Pont Alexandre III. After an exhilarating morning of walking the gallery corridors, replenish your energy levels with lunch in the museum before heading to the area surrounding the PalaisGarnier, Paris’s opera house. Afterwards, you have an option of having a French 4 course Dinner and Show experience or spend time shopping at the legendary department stores Galeries Lafayette. For some members of the group it will be time to say goodbye to new-found friends, while others will opt to stay another night in this French city of delights before picking up the Green Line tour the next day. 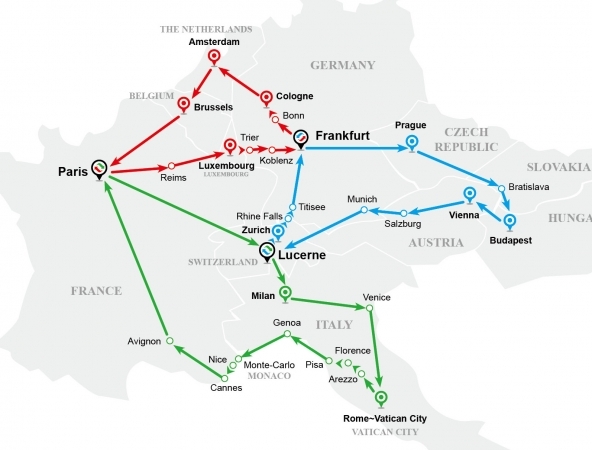 The Red Line tour leaves from Paris for a delightful scenic journey through the rolling countryside of the Champagne region, famous the world over for the sparkling white wine produced here. 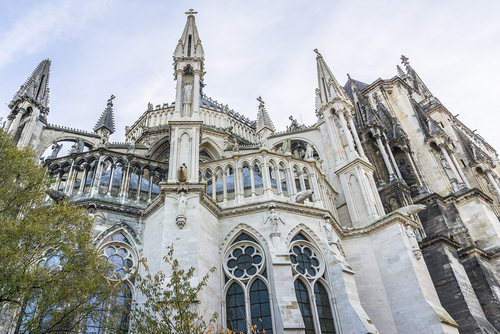 Enjoy seeing the historic attractions of provincial capital Reims, including the city’s cathedral – a key national heritage site, where coronations of French kings took place from the 11th century onwards. 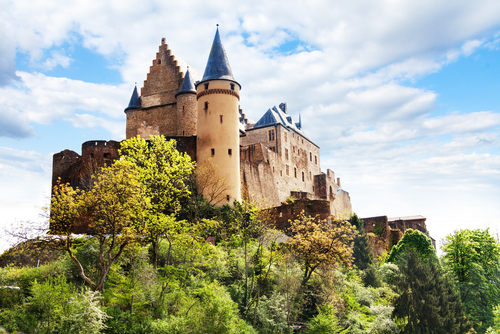 History and tradition are equally evident in your next location: Luxembourg, the world's only remaining Grand Duchy. After arriving in refined Luxembourg City, you’ll be introduced on foot to the main places of interest, including the Place de Constitution and Pont Adolphe, before having time for further exploration on your own. Today we leave Luxembourg behind and head across another European border into Germany. The first stop is historic Trier, Germany's oldest city and the birthplace of Karl Marx. You’ll have the chance to see from the outside the house where the influential philosopher was born, which now functions as the Karl Marx Haus museum. Your walking tour then takes you into the centre of Trier; here you can look around the city's impressive cathedral, where the celebrated Holy Robe – said to be the tunic of Christ – is preserved and occasionally displayed. Trier is also known as ‘The Second Rome’ (Constantine served as an administrator here for 10 years), and significant legacies of the once-great empire remain today. The highlight is undoubtedly Porta Nigra, the best-preserved Roman city gate north of the Alps, which you'll get to see and photograph. After an exciting morning in Trier, you'll drive on to Koblenz, famous as the location of the confluence of the Rhine and Mosel rivers. Here you have the option of indulging in a relaxing lunch alongside the water, then afterwards you can also choose to add on a scenic Rhine boat cruise for some memorable city vistas. Back on dry land you'll drive through the wine-making town of Rüdesheim. 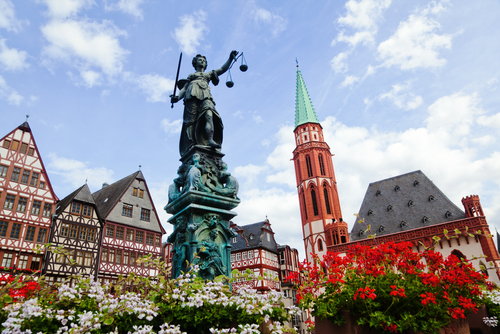 Then it's on to Frankfurt am Main, where you'll discover the delights of Römerberg, a charming plaza with a distinctive medieval town hall as its centrepiece. Met by your driver in the arrival terminal and travel in a comfortable car to your group hotel. Available at € 45 per person per way ( 2 passengers and up). 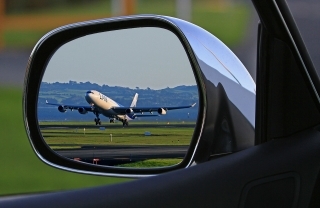 Transfer from your group hotel to airport departure terminal after the pleasant trip. Stay stress-free one night before your tour starts at well-picked 3-star hotels. Available at €50 per person based on twin room sharing. Stay comfortable before you catch your flight after the tour at well-picked 3-star hotels.